What is the first thing to do when you get a new crystal? How to get the most out of crystal vibrations on a regular basis and avoid unfavorable energy they collect? It is all about cleansing. Deep energy cleaning is crucial for every stone and crystal and should be inherent part of crystal owners’ routine. 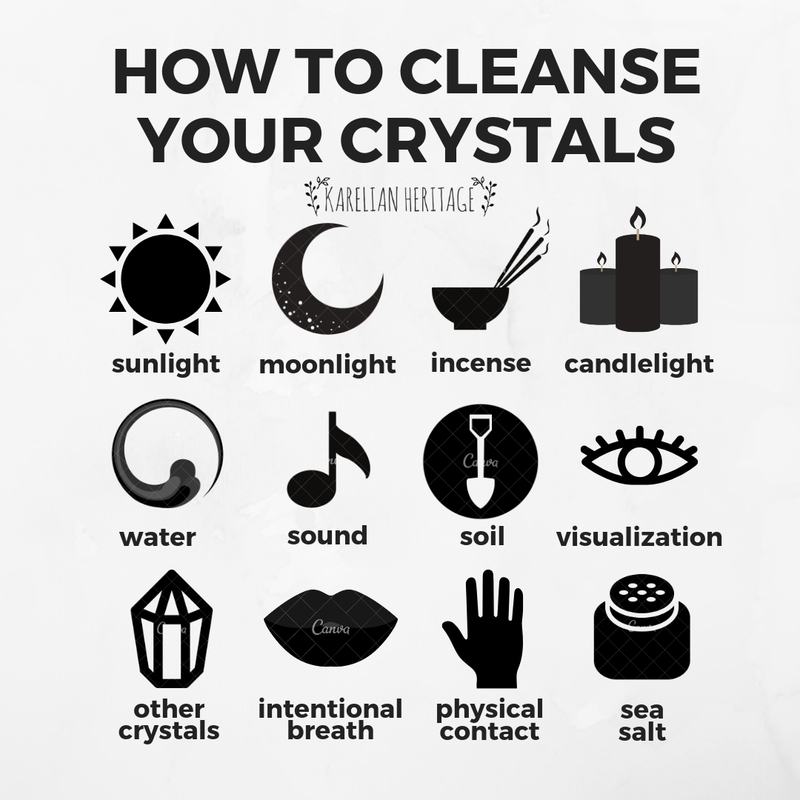 There are lots of ways to cleanse your crystals from quite simple sunlight or moonlight rituals to more advanced techniques including intentional breath or visualization. One of the new but popular practices is so-called crystallized cleansing. It implies purifying your crystals with the energy of other stones. Such crystals as selenite, clear quartz or shungite have powerful vibrations and are capable of cleaning and re-charging other stones without compromising their own energy and healing properties. Unlike quartz and selenite, shungite is a kind of newcomer in the cleansing crystals club, but more and more crystal healers tend to use this Karelian stone. What makes shungite so precious? The point is that shungite clearing energy can be incorporated to multiple crystal cleansing and charging rituals. Firstly, you can use shungite points as one of the most beneficial shapes to work with. Simply wave small shungite point over and around the crystal or stone that you’d like to rejuvenate to wipe it clear from any negative vibes it may collect. This quick energy rinse will be extremely useful after crystal healing session. Simple, speedy and very effective! For more long-term effect try to keep big shungite point near the place where you store your crystals and regularly lay your stones on a piece of shungite leaving overnight. It is a classic and very effective way of shungite crystal cleansing and re-charging. Shungite is known for powerful grounding energy it will be happy to share. 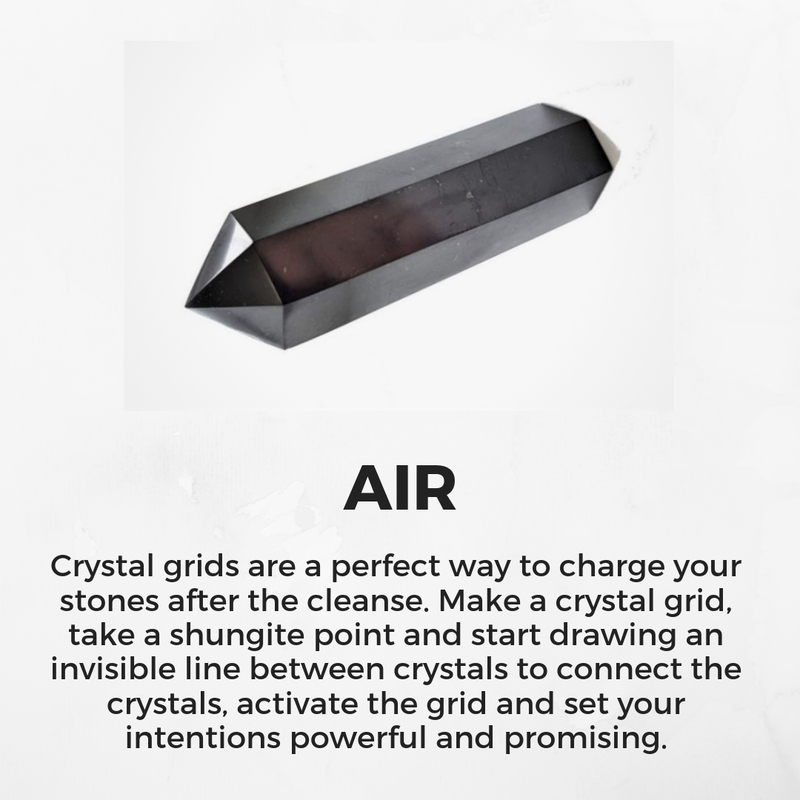 If you create a crystal grid and put shungite point into its center letting it accumulate and disseminate its vibes for at least 6 hours, it will be equal to burying the crystals within the Earth for 24 hours. Another way to use shungite purifying power is water crystal cleanse ritual. Water is the most potent cleanser and shungite is able to enhance its overall effect. 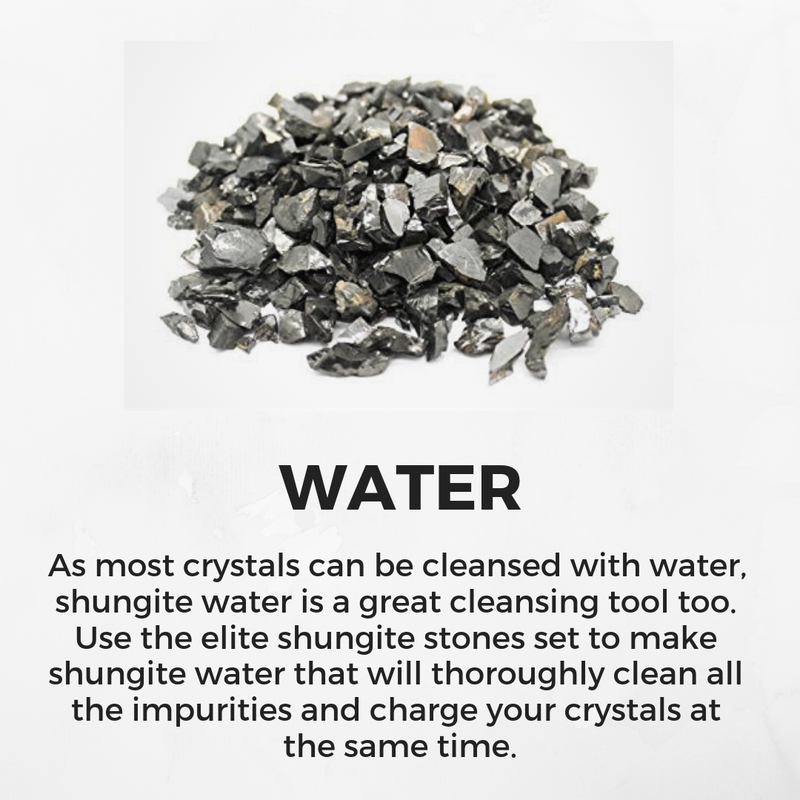 Use shungite water (instead of running tap water) to rinse your crystals gently getting them a fresh start. Take about 50 grams of elite shungite stones and put them in one liter jar for at least 5 hours. Shungite will purify and energize water. Then submerge your crystals briefly in a bowl of shungite water and place them on a windowsill to soak up sunlight or moonlight for re-charging. 4 hours in a spot will be enough. Crystal healers recommend using shungite water to clean new crystals to get rid of the energies they’ve collected during a long journey to its final destination in your hands. But, please, be advised that some crystals may be dissolved or get rusted due to water exposure. So, do a small research before the cleansing to keep your stones safe. Cleansing smoke from burning herbs, Palo Santo, smoking wand or just candle is one more efficient ritual to clear healing crystals. 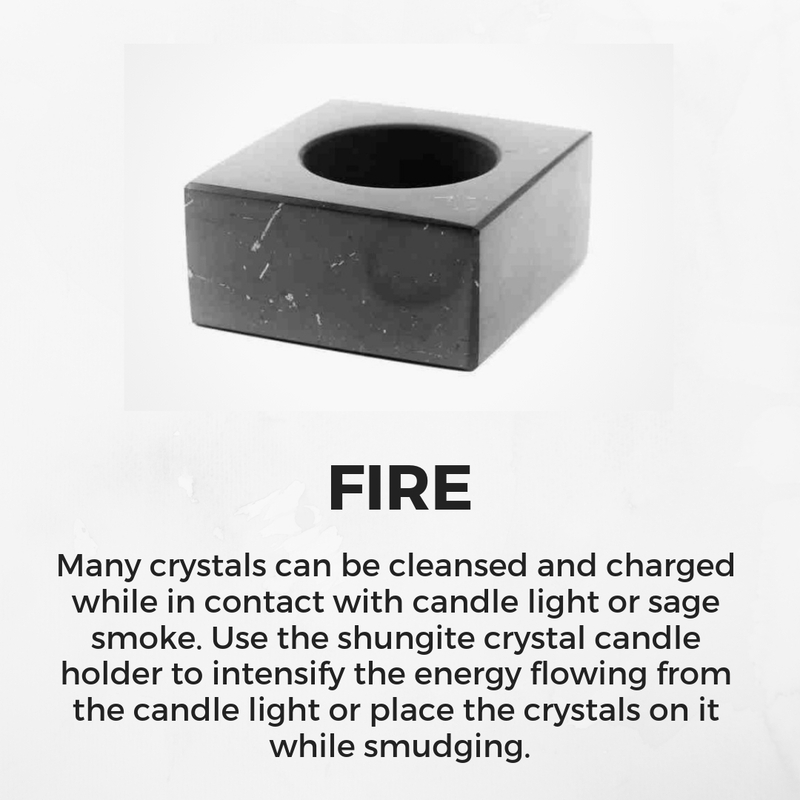 All you need to do is to hold your crystal or stone above the stream of smoke for a couple of minutes. Let the smoke dance over and around the crystals and visualize it destroying all the negative energy and unfavorable vibrations. 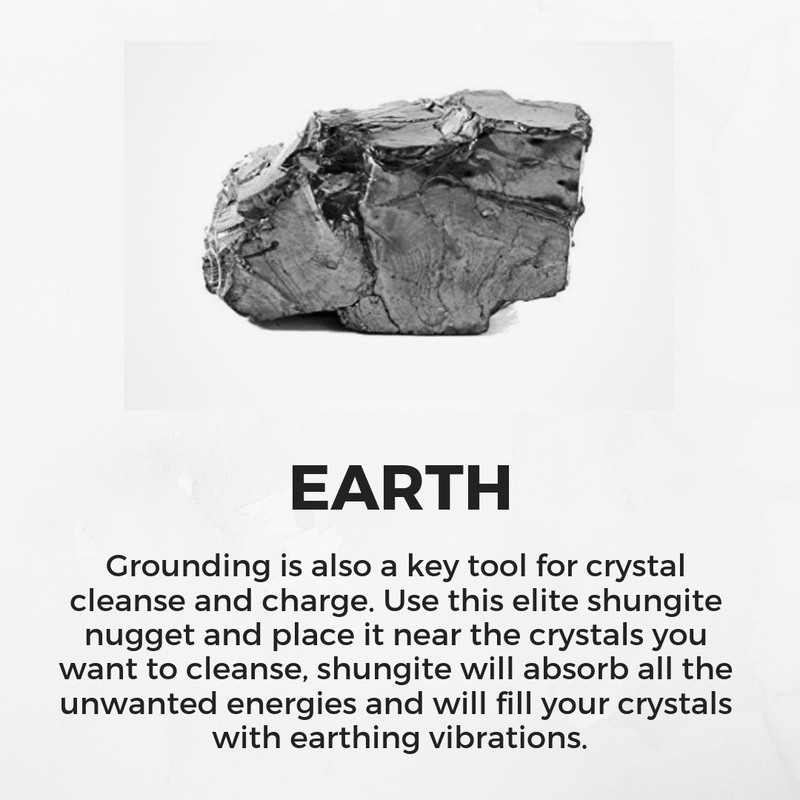 How to incorporate shungite cleansing energy into this practice? Use shungite candle holder or shungite teabowl to burn sage or bundles of other herbs in it. 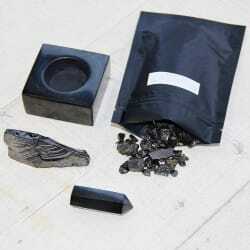 Shungite powerful healing energy will increase the efficiency of crystal cleanse by sacred smoke. If you’d like to experiment with these crystal cleansing and charging rituals with shungite stone, try out our exclusive shungite crystal cleansing set. Shungite will let your crystals experience natural energetic reset and activate them. You will be able to proceed with manifestation and further crystal work. What is the best complimentary crystal sphere to use alongside a shungite sphere for protection and balancing in a bedroom ? The book Shungite and many other sources have said that cleansing Shungite is not necessary. This needs to be settled. It goes along with the statement that Shungite is re-informing fields by alteration of particle/wave spin to right and not actually absorbing them. This is an important distinction and also needs to be settled. The book SHUNGITE by Regina Martino, and the testing/experimentation they have done on the effects on the body's energetic field seem quite definitive on these questions, but don't align with your recommendations. Can you give more about the need to clear and recharge Shungite. I get that shungite used in water purification and intended to absorb may need clearing/cleansing/recharging, but that which is used for protection and sheilding from EMF and microwaves has been said to not require treatment because it does not absorb but actually modifies these fields. Use of the powder in paint on a wall or tiles on a wall for sheilding is an example of where washing and recharging in sunlight may not be attainable. More information/discussion facts on this is needed . Hello I have been using Shungite (not Elite) for water purification for over a year now and I'm not sure if there are any uses for the used Shungite instead of just discarding. I wondered if I could use them in the garden? Could you advise me please. Thank you.